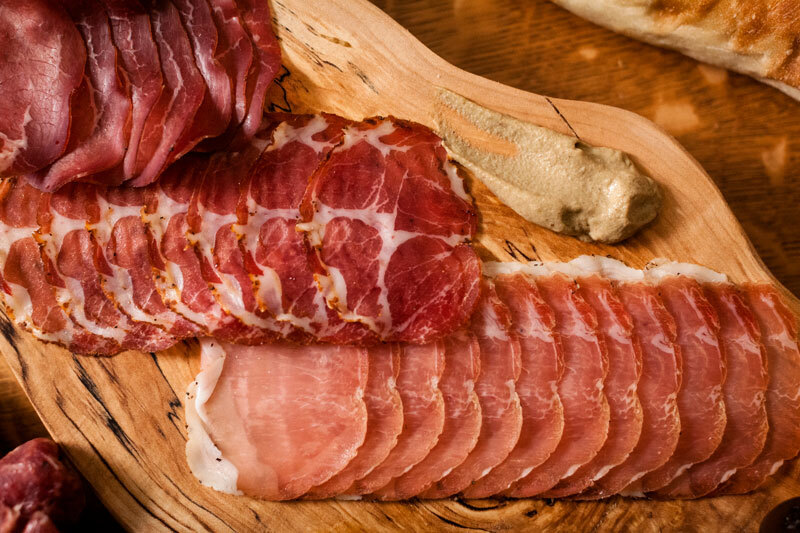 The Day of the Pig comes but once a year (usually mid-May, in case you’re wondering) but there’s no reason you can’t enjoy handcrafted cured meats at any time, thanks to Seed to Sausage. Joining the Makers+Mongers celebration at The Great Canadian Cheese Festival this Saturday, Seed to Sausage brings a commitment to ethically raised animals and a dedication to making things their own, sourcing products right back to the seed they began with. If you’ve never ventured out to Sharbot Lake, Ontario, now is the time to do it. 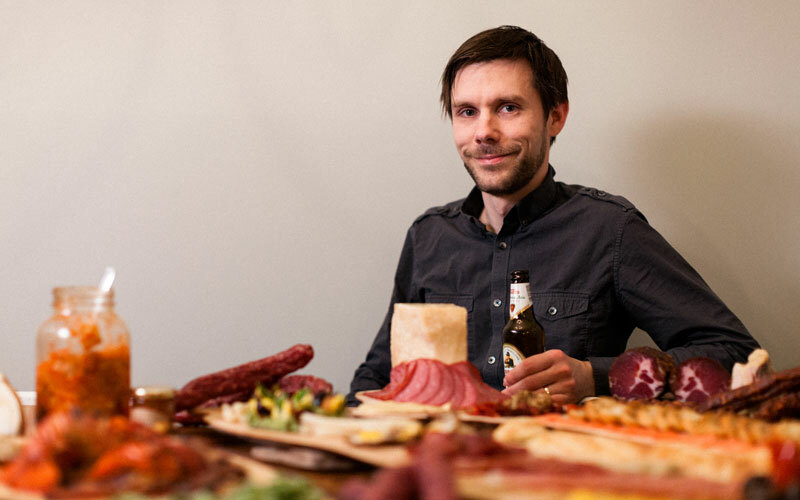 Begun by chef and entrepreneur Michael McKenzie only a few years ago, Seed to Sausage has quickly gained recognition, to the point where it’s now hard to believe we’ve ever sourced our bacon from anywhere else. The principles of “local. ethical. humble.” craft are at the core of the Seed to Sausage brand, where everything is handmade in small batches. 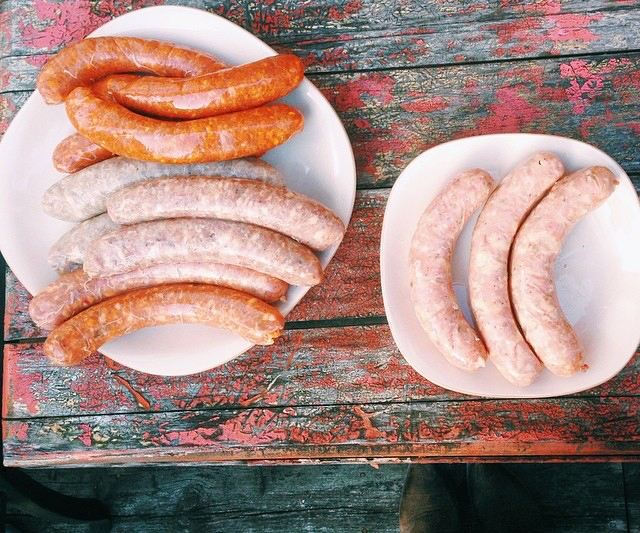 For Makers+Mongers, Seed to Sausage will grill Jalapeño cheese curd smokies. Photo: Laura Voskamp. Beyond his own products, the Sharbot Lake Seed to Sausage headquarters also boasts a gourmet grocery store, stocked with all manner of accoutrements to help you enjoy your salumi to the max. You’ll find crackers, salts, and preserves, all selected with the meats in mind. This offering spills over into Seed to Sausage’s newest outpost: The S2S General Store, located on Gladstone Avenue in Ottawa. 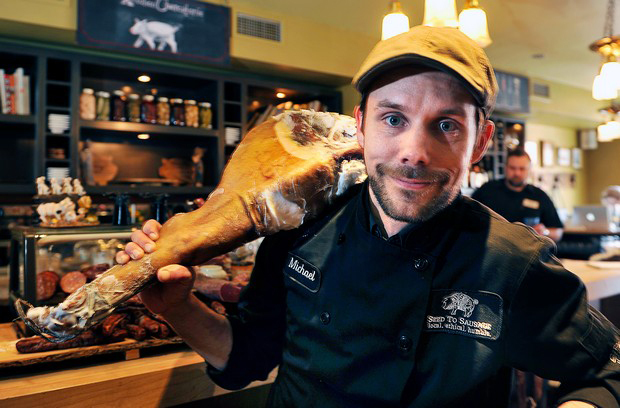 Born as a collaboration between multiple facets of Ottawa’s food scene, McKenzie has created a space where chefs, bloggers, and producers can come together to create a distribution point for small producers. The aim isn’t to be exclusive though: the S2S General Store wants its shoppers to love the products so much that they begin to ask for them at their local stores, opening up the scene for local producers to gain their own following. 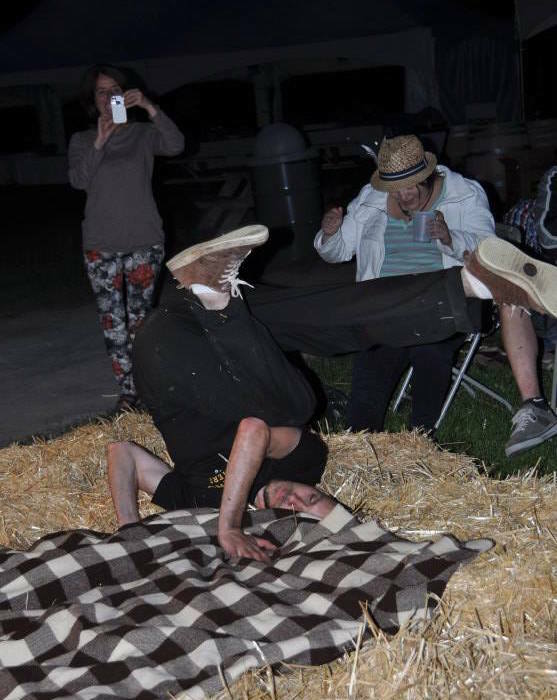 Unauthorized photo of Mike McKenzie break dancing in the straw at Makers+Mongers last year. Photo: Vanessa Simmons. And a following they’re sure to gain as McKenzie brings the local. ethical. humble. philosophy to the Cheeseburgers in Paradise soiree this Saturday. While we’ve yet to find a Jimmy Buffett song that sings the praises of bratwurst, it wouldn’t be a grill-up without sausages, and you’ll want to be sure to save room to try the Jalapeño cheese curd smokies McKenzie and his crew will serve alongside Burger Revolution’s gourmet cheeseburgers. Giovanni Le Brasso shows a guest how easy it is to cut an 80-kilo wheel of Emmentaler at the Switzerland Cheese display at the Gourmet Food & Wine Expo in Toronto this week. There are more wines to taste than is humanly possible in one evening and all kinds of fancy food to sample, but pulled pork was the clear winner in our hearts and stomachs at the Gourmet Food & Wine Expo in Toronto this week. Not just any pulled pork but a perfect parfait served up at Hank Daddy’s Barbecue stand. 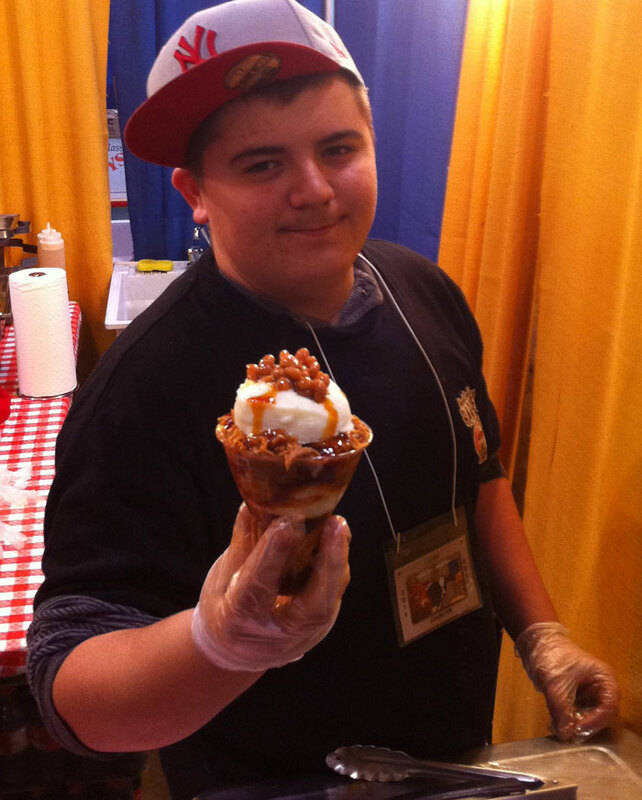 Pulled-Pork Parfait made by Hank Daddy's Barbecue, pictured with Hank's nephew Gordie. Here are the ingredients: pulled pork, Hank Daddy’s Original Barbecue Sauce, mashed potatoes, more sauce, another layer of pork, sauce, potatoes, more pork and a topping of baked beans. Talk about an ultimate take on comfort food! No wonder Jennifer Bain raved about it in the Toronto Star after sampling the dish at the Royal Agricultural Winter Fair last week. Cypress Grove Cheese from Northern California and Sobeys Ontario team up to present a divine plate of four goat cheeses made by Mary Keehn, one of the founders of the artisan-cheese movement in the U.S.
A delicious selection of classic and contemporary goat cheeses is available at the stand operated by Ontario Goat Cheese. Devil’s Rock, a creamy blue cheese from Northern Ontario, and squeaky cheese curds are front and center at the Thornloe Cheese stand. Major Craig’s Chutney is partering with two new artisan producers, Primeridge Pure and Seed to Sausage, to present a dynamite charcuterie platter. Dairy Farmers of Canada is presenting winners of the Canadian Cheese Grand Prix in tasting seminars at the All You need Is Cheese stage. Also participating in the Expo: Finica Food Specialties with Mariposa Dairy and other products, Ivanhoe Cheese and Switzerland Cheese.